Most fiction writers shy away from using real people in their work, but not Katrine Kathryn Rusch (hereafter to be called KKR in this review). The title story of Recovering Apollo 8 And Other Stories is an award-winning re-imagining of the Apollo 8 launch, examining what would have happened if that space flight had been unsuccessful in its mission to orbit the moon. By telling the tale from the point of view of Richard, a man who had been a child when the launch took place, she gives the piece a deeply personal viewpoint that makes it identifiable to all, so that the moment when he believes he about to meet the recovered crew for the first time is palpably intense. ‘”He had waited a lifetime for this. He wished the internal mikes were off. He wanted to whisper, “Welcome home, gentlemen. '”Other tales examine the night FBI chief J. Edgar Hoover is assassinated, and the uncovering of a mass alien grave in Oregon. Both of these stories bind fictional events to real prejudices – highlighting truths about the human condition more powerfully than any factual account ever could. The writing is very much concept driven, as we’re taken into a refugee camp to meet one of a growing number of children implanted with explosive chips set to detonate when they reach the age of five. The idea of newborns being transformed into bombs is shocking, but KKR’s delicate handling of it takes us beyond the sci-fi elements to the psychological challenges faced by War Reporters today. While the majority of her tales are action-packed, in several little more happens than a single character’s emotional shift set against a futuristic backdrop – suggestion that love, grief and sorrow are elements that transcend space and time. The one disappointment in the collection lies not in the writing, which is strong and resonant throughout, but in the cover art. A friend of mine spying it on my coffee table commented, What a boring book! And yet in actuallity this is one of the most exciting short story collections I’ve read in years, perhaps ever. However much we try not to do the clichéd thing and judge a book by its cover, it’s an unavoidable response, and the stark orange cover with its rocket motif lacks the emotional breadth KKR’s stories deserve. 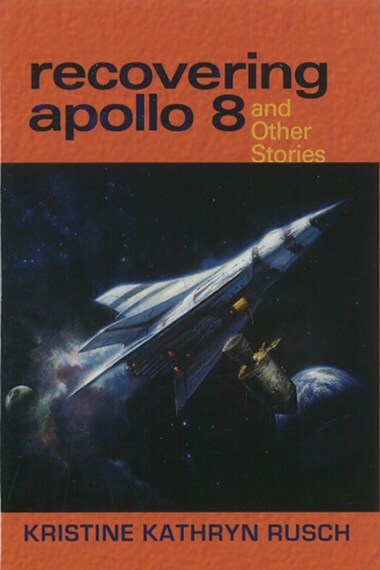 Recovering Apollo 8 And Other Stories by Kristine Kathryn Rusch is published by Golden Gryphon Press and is available to buy from amazon. To submit or suggest a book review, send an email to Judy(at)socketcreative.com. This entry was posted in Reviews and tagged Book reviews, short story collections by Judy. Bookmark the permalink.